On September 9, the forty-fifth anniversary of the Attica prison uprising, inmates across the country went on strike to protest their working conditions. Specific demands vary from prison to prison, but as a whole the protests are focused on the practice of forcing inmates to work and then paying them as little as a few cents an hour – if at all. It’s not a stretch to call this modern-day slavery since it is made possible by a little known clause in the 13th Amendment that says the abolition of slavery does not apply in cases where it is used “as a punishment for crime whereof the party shall have been duly convicted.” Basically: if you’ve been found guilty of any crime in this country, you can be enslaved. 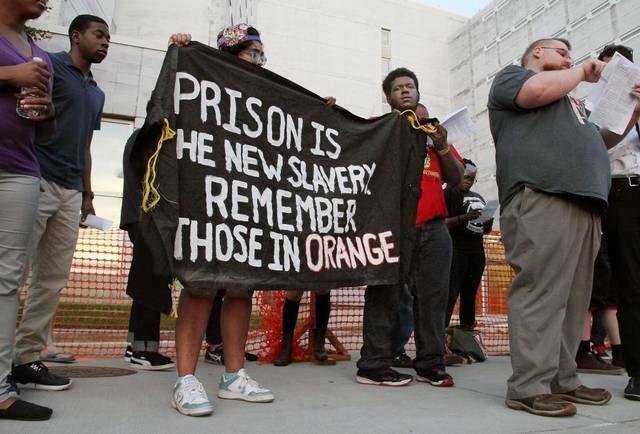 Details about the protests are hard to come by, but organizers estimate nearly 25,000 inmates in 12 states have been involved, participating in work stoppages, marches, and hunger strikes. If those numbers are even somewhat accurate, that would make this the largest prison strike in American history – and one that is still going on. And yet, there has been almost no reporting on the protest by any major newspapers or news channels.